Speak to Wellsy (or email him here) or more info and to book a place talk to Helen in the church office or email Helen. Please sign up early to help with planning. Toybox is a group for toddlers, babies and their carers and is a mix of free play, singing time for the children and a short 'thought' for the adults. It's a great place to make new friends and enjoy a coffee and home-made cake. 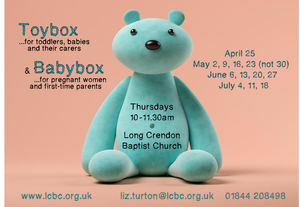 Babybox is run alongside Toybox in a separate room as an informal group, for pregnant women and new parents to chat together. Lighthouse is back in 2019! Lighthouse Thame is a holiday week for children and young people in Thame and the surrounding area that takes place in the summer holidays at Thame Showground. 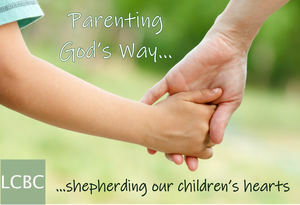 It is run through a partnership of local churches and supported by hundreds of volunteers. Lighthouse provides an opportunity for children and young people to learn more about God’s amazing love for us all and understand what a difference Jesus makes to our lives. This is provided in a safe, fun and enjoyable environment for everyone. The Lighthouse format is simple. At the start and finish of each day we gather everyone together in the main marquee for fun activities, competitions, games and songs. The daily gunging of a leader is always great fun and each day the activities close with some great songs involving plenty of actions.